Lynden Air Cargo answered the call on Sept. 8 to mobilize relief flights for Hurricanes Irma, Jose and Maria. "We began flights into the Caribbean on Sept. 17 once there was a clear identification of needs," explains Rick Zerkel, Lynden Air Cargo President. Lynden is currently under contract with Diplomat Freight Services (DFS) to provide continued air support for sites in the Caribbean. "Logistics have been a challenge as there has been limited information on which airports are open and have uncontaminated fuel supplies," Rick says. "Some of the islands have completely lost power. Hotels have also been hard to find in some of these locations because they are still being used as shelters for families who cannot go back to their homes or sustained damage during the storms. We have also had to pause flying when Hurricanes Maria and Juan hit the Caribbean a second and third time – on occasion flying around the storms to get to any locations we could." Lynden Air Cargo has been conducting flights through DFS, the Federal Emergency Management Agency (FEMA), the Red Cross and other supporting agencies and governments to bring in food, water, trucks, fuel and other disaster response supplies. "We anticipate we will be flying continuously for quite some time – there is no indication that it will be slowing down any time soon," Rick says. As of late September, Lynden aircraft have flown to the following locations based out of Curacao, Aruba and Miami: St. Martin, San Juan, St. Thomas, St. Kitts, Anguilla, British Virgin Islands, St. Croix, Grand Turk Island and Providenciales Island (a part of the Caicos Islands). The company is especially grateful to their flight crew and flight operations staff who have performed admirably while working under constantly changing conditions with limited information. 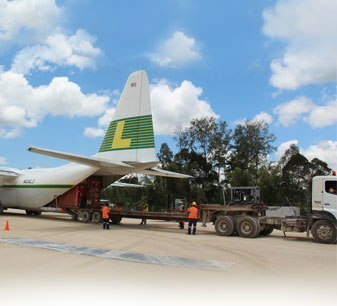 Lynden Air Cargo’s L-100 Hercules aircraft is being put to use flying relief supplies to Vanuatu after Tropical Cyclone Pam devastated the South Pacific Islands March 13. Communications company Digicel Fiji chartered a Lynden Air Cargo plane from Nadi, Fiji, to the capital city of Port Vila within days of the cyclone. It was loaded with food rations and technical equipment to repair towers and networks to restore communications throughout the islands. Now working with the World Food Programme (WFP), Lynden continues to pick up more supplies from Brisbane, Australia, for air delivery to Port Vila in support of humanitarian efforts. Lynden operates a fleet of six Hercules around the world specializing in remote site services and requiring minimal equipment for loading and offloading. 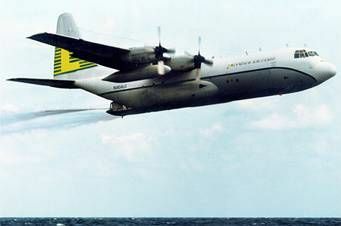 The unique features of the aircraft make it ideal for flying aid into isolated disaster areas. 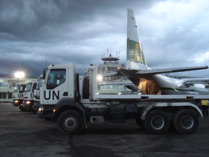 Lynden Air Cargo has provided disaster relief assistance at some of the world's worst disasters, including the Haiti earthquake in 2011 and the Indonesian earthquake and Samoan tsunami in 2009. 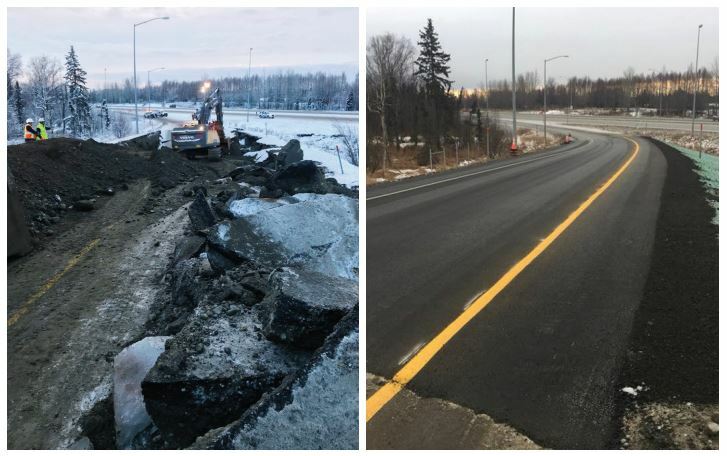 Working with the Federal Emergency Management Association (FEMA), the Red Cross and the U.S. Military, Lynden has delivered emergency vehicles, portable hospitals, food, water and relief workers to ravaged areas across the globe. Lynden Air Cargo is one of the Lynden family of companies, whose combined capabilities include shipping to Alaska, truckload and less-than-truckload transportation, barge service to Hawaii and Alaska, charter barges, worldwide air and ocean forwarding, third-party logistics, trade show shipping, intermodal bulk chemical hauls, scheduled and chartered Hercules L-382 cargo aircraft and multi-modal logistics. Lynden companies are repeat winners in the annual Quest for Quality awards presented by Logistics Management magazine. In June of this year, more than 29,000 people in the Western Province of Papua New Guinea were affected by flooding caused by heavy rains. In the township of Daru, flood waters destroyed homes and gardens leaving the victims without food, water and shelter. 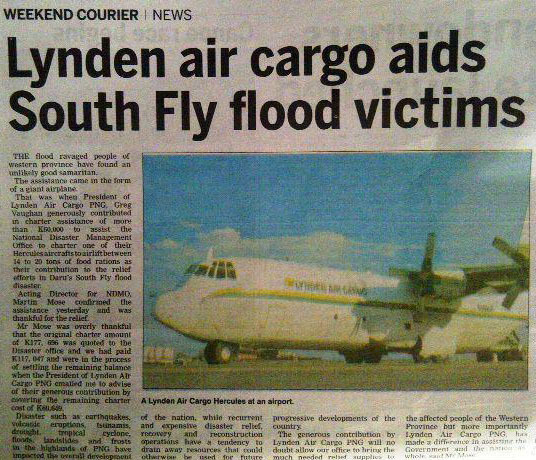 Lynden Air Cargo (PNG) Ltd. provided a charter to fly rice and other emergency supplies to the people of Daru. “We flew from Port Moresby to Daru,” says Captain Chris Nichols. “The people were very excited to see us come in. 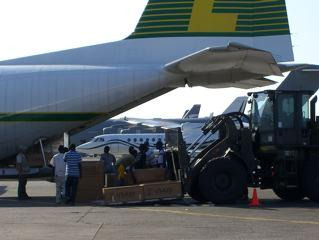 The locals unloaded the first half of the airplane by hand into trucks, then a fork lift showed up and we unloaded the rest.” Martin Mose, Director of the National Disaster Management Office praised Lynden for its assistance to the people of Daru, and for its contribution to help the government and the nation recover from the disaster. It’s estimated that the people of Daru will have to depend on relief supplies for up to three months until they can grow their own food. 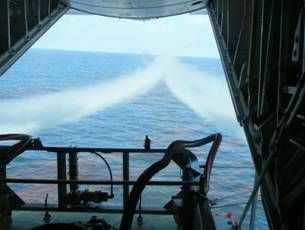 Lynden Air Cargo’s N403LC is shown here on one of the 81 aerial oil-dispersant missions Lynden flew in support of BP’s Deepwater Horizon response efforts in the Gulf of Mexico earlier this year. The first L-382G began flying missions in April, followed by the second aircraft, N401LC, in June. Both aircraft finished work in the gulf in July when the well was permanently capped. 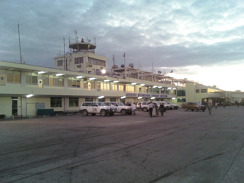 Flights operated out of Stennis International Airport in Mississippi. Chief Pilot and Captain Mike Redmon and 35 Lynden Air Cargo employees were involved in the project. 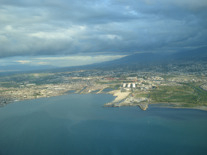 Lynden Air Cargo has helped with disaster relief all around the world, including relief flights to Haiti in early 2010 and delivering emergency supplies to Samoa and Indonesia after the earthquakes in late 2009. 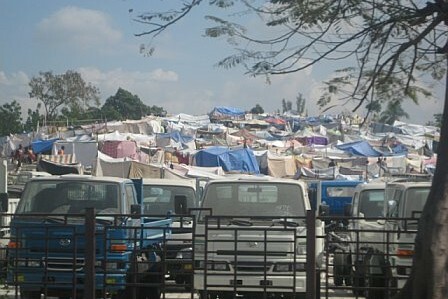 Like many, I was keeping updated on the terrible situation in Haiti earlier this year via the evening news. 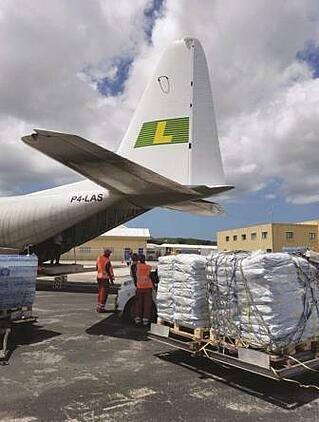 I immediately recognized the yellow "L" of Lynden Air Cargo's plane in Port-au-Prince. It got me thinking... Over the years, Lynden International has grown into a global company with offices on every continent. 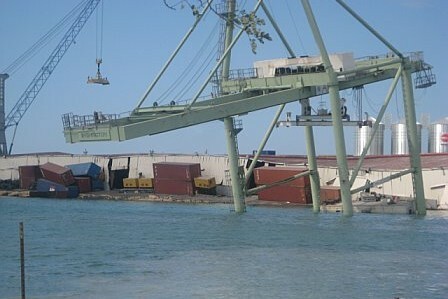 News of devastating events like the January earthquake in Haiti, and more recently in China and Chile, are always upsetting to hear about, but they hit us especially hard as we often have employees and partners working in these locations. Last year our sister company, Lynden Air Cargo, began flying relief missions to Samoa and Indonesia to deliver medical supplies, food and other essential cargo after the earthquake and tsunami. Just a few months later, Lynden Air Cargo was one of the first responders after the Haiti earthquake, and it is ready to use its Hercules aircraft to aid other countries if future disasters strike. On a smaller scale, our employees organized an effort to donate money to help Haiti. Lynden offered to match each employee's contribution up to $100 at all of the Lynden companies, not just Lynden International. In just a few weeks, thousands of dollars were collected; half was sent to Mercy Corps and the other half to the American Red Cross. A total of 80 employees from 11 different Lynden companies donated. It's a big world, but it becomes much smaller when disaster strikes. We are reminded very quickly of our shared humanity. This spills over into business, too. Good customer service is essentially taking care of people and their needs - whether it's helping strangers after a disaster or working with a customer on a complicated logistics solution. We think we're pretty good at both. 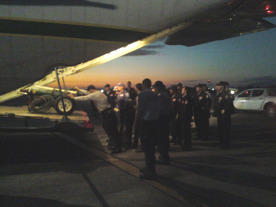 Lynden employee Tim O'Brian recently flew down to Haiti on a Lynden Air Cargo relief flight. 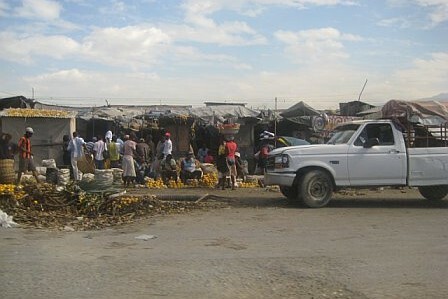 He took a number of photos from the ground in Haiti, and was kind enough to share his experiences. Several photos are shown below, and you can view all of Tim's pictures here (this link will take you to a Kodak photo gallery). 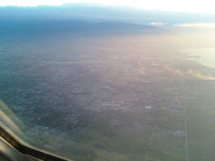 Learn more about Lynden's involvement with relief flights to Haiti. Other relief flight blog posts - including flight experiences shared by Lynden Air Cargo's captains and crew - can be viewed here. I have a little story for you on Haiti. On my last flight there I was greeted by the USAID rep and asked him for a couple of individuals to help with the offload. Fifteen minutes later he returned with about 15 strong individuals, all local residents that they recruited. Well, some of them had seen pictures of airplanes but had never have been on an aircraft, period. So I took a little extra time to offload and had groups of 4 at a time come up and help and after we finished we all got together for a 15 minute photo shoot. The faces and laughter that came from these people was priceless, especially after all they have gone through. It was terrific to share with them the little I had to offer and the memories that I will come home with will be treasured. 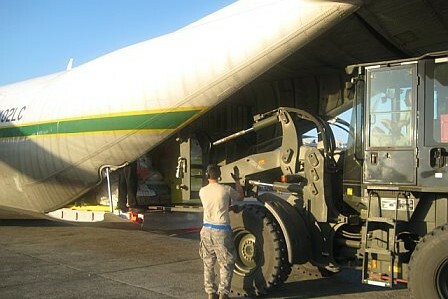 Photo: Haiti locals helping to unload a Lynden Air Cargo Hercules aircraft (photo courtesy of Northern Air Cargo).